I've never been a big fan of bell peppers, but since I'm pregnant and I'm supposed to eat my veggies I thought I should give them a chance. They're high in dietary fiber and vitamins A, C, K, and B6. My husband is on the South Beach Diet in an attempt to lose weight (I think there's some truth in husbands gaining weight when their wives are pregnant). I want to cook him yummy carb-free food. The best South Beach Diet Web site I've been able to find is www.kalynskitchen.com. It's full of recipes that would be appropriate for people on the South Beach Diet, but these recipes are also awesome for anyone wanting to eat healthy food. I found a recipe there for stuffed bell peppers and they looked delicious and right up my alley. 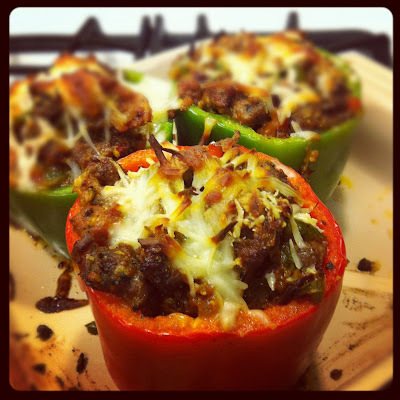 What a great way to get me to enjoy bell peppers -- mix it with italian sausage and cheese. I tweaked the recipe a bit by adding ground up pistachios and garlic and using pork sausage instead of turkey (which I realize is a less healthy choice, but I freaking love pork sausage). The pistachios acted like bread crumbs and added a little more bulk and depth to the dish. I'm also spoiled because I used homemade Korshin Italian sausage. I served the peppers with steamed green beans and it was truly a meal worth repeating. Preheat oven to 375 degrees. Brown the beef and sausage together over medium heat. Break up the meat as much as possible while you cook. Meanwhile, chop a couple of the bumps off the bottom of each pepper so they sit flat. Reserve the chopped bits. Chop the tops off the peppers and clean out each one. Cut around the stem of the cut-off tops and chop finely with the pepper bottoms. Add the pistachios to a small food processor and grind till it's the consistency of coarse corn meal. It doesn't have to be perfect. When the meat is browned, set aside and add the oil to the pan. Add the peppers and onions and saute for a few minutes. Add the garlic, oregano, basil and pepper and cook till garlic is fragrant, stirring often for about 4 minutes. Return the meat to the pan and add the marinara sauce and pistachios. Cook for another few minutes. Turn the heat off and let cool for 5 or 10 minutes. 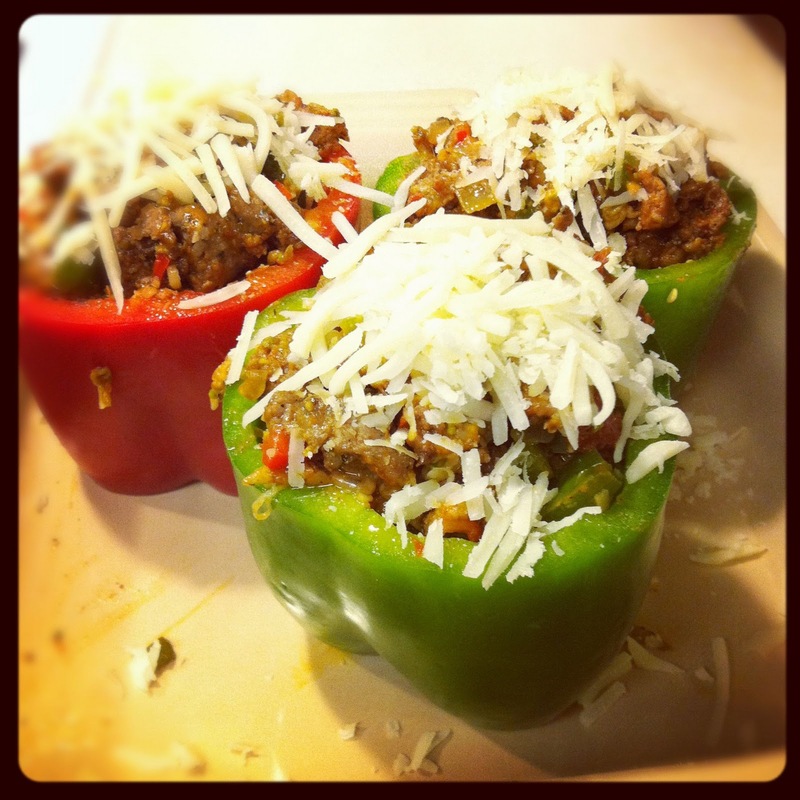 Add all the cheese, but reserve some mozzarella to sprinkle on top of the peppers. 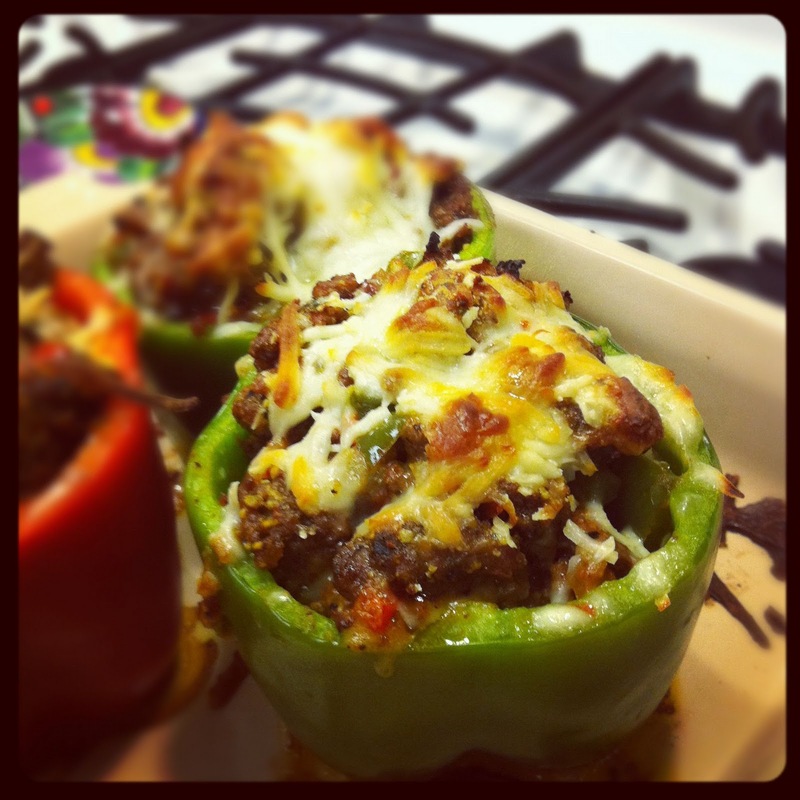 Make sure all the ingredients are combined and fill the peppers, packing in the filling tightly and letting it mound on top of the peppers. Top with mozzarella cheese and loosely cover with a foil tent so the foil doesn't touch the cheese. Bake for 20-30 minutes. Remove the foil and bake another 15 minutes or till the cheese is brown on top. Serve with steamed green beans tossed with butter, pepper, parmesan cheese and lemon juice.